We create experiences that anticipate our community’s diverse needs and exceed expectations. We help people make their lives better by providing the tools to successfully navigate the world. We welcome everyone in the community. We support and defend our customers’ right to access information without judgment. We build stronger communities through mutual trust, collaboration and shared goals. We serve the needs of the entire community by using resources responsibly, fairly and transparently. Learn more about our inclusive process for determining community impact goals. The Topeka and Shawnee County Public Library is a 21st-century, landmark library, and features the Alice C. Sabatini Gallery, the Millennium Café, Chandler Booktique (bookstore and gift shop), free meeting rooms, computer training and free Wi-Fi access. We’re your place. Learn what’s happening at your library by keeping up with Library News, delivered to your mailbox, and Library News Update, delivered to your email inbox. 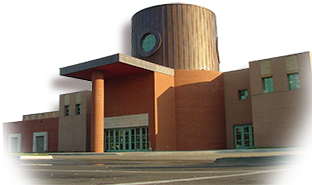 Located in the heart of Shawnee County, the library has a collection of more than 500,000 books and serves more than 100,000 registered borrowers. About 3,000 people walk through our doors daily. Our bookmobiles make about 20 stops six days a week traveling across the county. We provide services to 55 senior living facilities and 85 homebound individuals. Our website serves customers’ needs 24/7. The library offers state-of-the art technology, youth programs that encourage learning and reading, accessibility services addressing the needs of older readers and persons with disabilities, and reference and research tools. The library is a great meeting venue for community groups and is a cultural hub for art, music and literature. People of all ages discover and experience art at the Alice C. Sabatini Gallery. We connect individuals to culture, art and artists – both modern and classic. The gallery is also recognized for two national art competitions and its annual art exhibit for children. Professional exhibits from the library’s permanent collection (the oldest in the city) as well as traveling exhibits draw nearly 20,000 visitors annually. Each year, Library Journal looks for role model libraries to vie for the honor of being named the Library Journal / Gale Cengage Learning Library of the Year. More than 9,595 public libraries in the U.S. and Canada are eligible to apply for the $10,000 prize celebrating the library that most profoundly demonstrates creativity, innovation, leadership and outstanding service to its community. 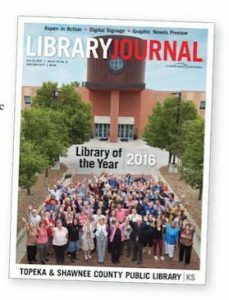 As the 2016 Library of the Year, the Topeka and Shawnee County Public Library was the Library Journal cover story on June 15, 2016 and was honored with a gala reception by the American Library Association June 26, 2016 in Orlando, Florida. Past winners have gained immeasurable prestige within North America and their home communities, and considerable national media coverage. It is an honor that resonates for a lifetime.